It will also record pH and temperature values and calculate the first and second derivatives of the pH for easy equivalence point determination. The Drop Counter can also be used for conductimetric or potentiometric titrations using our Conductivity Probe, Ion-Selective Electrodes or any electrode with a 0 to 5-volt output. You could even use it instead of a utility clamp anytime you need to hold an electrode in place. The Vernier Drop Counter can be used with your own buret or with the Reagent Reservoir included. This reservoir was designed to keep the drop size consistent and to make drop rate regulation simple and easy. In addition, we include a Vernier Microstirrer-a magnetic stirring paddle that slips onto the tip of your pH Sensor. When used with any magnetic stirring plate, the Microstirrer provides a faster response after each drop added. 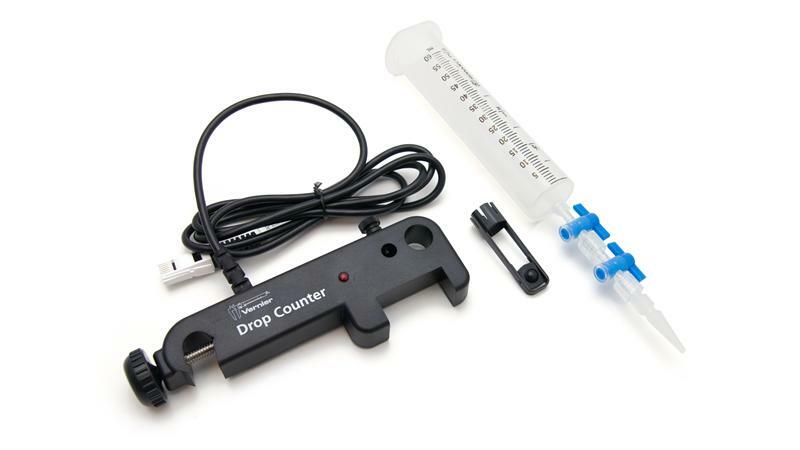 The Vernier Drop Counter includes a cable, Microstirrer, and the Reagent Reservoir. The Drop Counter requires a compatible interface and software to collect data. Interface and software sold separately.